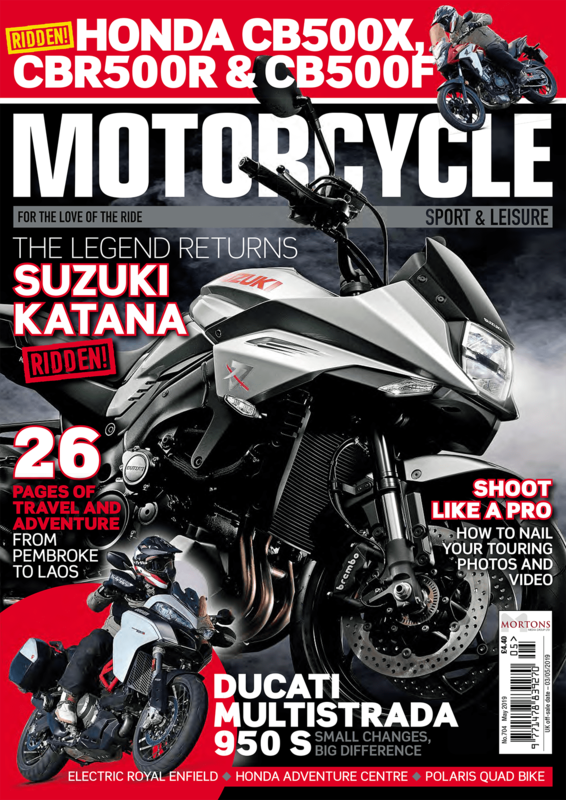 This month, a UK Mid Ride, around the coast of Britain by Triumphs – what could possibly go wrong? 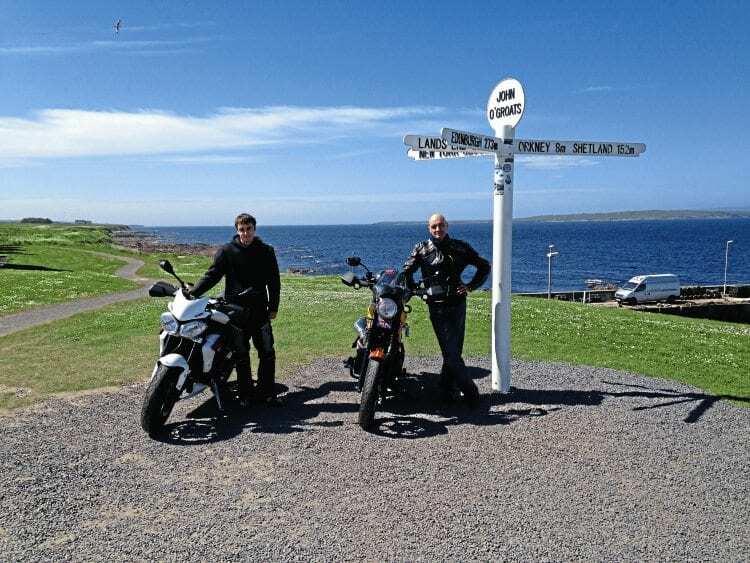 Father and son, two weeks’ holiday in June, a brace of Triumphs (Street Triple and Bonneville) – what else could we do but a mega-ride around the UK (anti-clockwise)? We’d hug the shore as much as time and road allowed and thanks to my organised wife had a succession of B&Bs booked en route. Living on Cornwall’s north coast we tackled the initial section the weekend before (a Bank Holiday just to add to the fun). The stunning B3306 views after St Ives (though shrouded in mist today) always remind me why we moved here. After the obligatory picture at Land’s End, England’s most westerly point (some still argue the case for Cape Cornwall) we continued around the coast to the most southerly, Lizard Point. Here we suffered an annoying narrow lane encounter with a stubborn driver who seemed to think motorcycles can reverse uphill, forcing us to roll on to a crowded footpath. Beautiful day on the sunny south coast. No need for the Lizard fog horn, as the curtain of mist burned away to reveal spectacular views. After getting lost on the myriad of Cornish lanes, we eventually stumbled upon ‘King Harry: possibly the world’s most scenic ferry. And after this breath of fresh air we dived back into the narrow, often gloomy lanes. These gravel-washed, cave-like tracks never fully dry out, as wall and hedgerow help form dark tunnels. Bursting into sunlight offered a stark contrast, as dry roads snaked through vivid greens, rolling away towards azure and turquoise, where sea and sky met. The sun was sinking as we hit St Austell so we took the A390 home. St Mawes, and one of their glimpses of sea. The following Wednesday, fully loaded, we started out for real and retraced the A390, where Luke was nearly T-boned by some nutter on a roundabout. Over the Fowey ferry we were soon free of Cornish walls but after a few cold days the heat caught us by surprise, with too many layers and not enough water as we battled through the nightmare Torbay traffic. But shortly after we were gliding through the magnificent Devon/Dorset landscapes, sea glimpses glinting to the right. The B3157 Abbotsbury road was breath-taking, and for sentimental reasons one of my favourites. The only spoiler, the return of sea mists to obscure Chesil Beach; it was a joyous end to the day nevertheless. Stubborn fog hung thick in the morning and the Osmington White Horse (a giant chalk figure of George III on horseback) had galloped off into the mist. I’d been dreading the crowded south coast but it turned out to be relatively stress-free. Never having been to the South East before, we were both surprised by glorious scenery, particularly the splendour of the South Downs and Romney Marshes. After another touristy photo stop at Beachy Head, I pondered some biking blights we have to deal with. Rain is no problem as long as we’re prepared. Potholes, I fear we must learn to live with, and also fuel spills. With these niggles, ever-increasing congestion only compounds the problems, and I just don’t understand the low ratio of two to four wheels. Without exaggeration, we spent 60% of this holiday lost (my ‘sat nav’ is a quick scribble on a slither of paper slipped into polythene and tied to the bars). We even managed to go around in clueless circles in Deal, which isn’t exactly a metropolis. Overgrown hedges often obscured the road signs, though ironically we did follow a trailer full of hedge trimmings that, caught by a gust of wind, simultaneously whipped and blinded us. Time chased today and after getting through the Dartford Tunnel we cut a few corners. Then, in a moment of sign-reading confusion, I (apparently) ploughed through a red-lighted roundabout, the uncomfortable truth only hitting me on my weaving exit. I stopped, but I’m still annoyed that those on green were stopping for no one, causing me to slalom for dear life. Meanwhile, wet weather had returned, and after a nightmare filtering through a jammed Lowestoft, we thankfully made it, damp and dusty, tired and a little shaken, to our night stop. Our nemesis, mist and drizzle, greeted us in the morning, but we had a fabulous ride nevertheless, skirting the Wash (smelt, not seen), then on to the plains of Lincolnshire, which had an odd feel of America about them. Fabulous roads today, spoiled only by the weather and unnecessarily long 50mph stretches plus the propensity for my Avon Roadriders to slide. Luke seemed fine on his Pirellis. Our first time over the Humber Bridge saw us ‘sliding’ through Hull completely lost, trying to locate the shore, but Scarborough compensated us with the tour’s ‘poshest’ B&B – a welcome respite after a long day. Ouch. The result of Luke’s 70mph trip down the A1, wrong side up. The road to Edinburgh was one of the worst in my life, but even worse for Luke. Mist and rain – again, ocean smell with no sea in sight, so apart from a detour to Lindisfarne, we planned to stay on the A1 all the way. On a straight stretch north of Morpeth, Luke (a better rider than me) came off at 70mph. £2 for a jubilee clip – is this a record? I looked behind and he’d vanished! Trying not to panic I pulled in and a car bowled up. 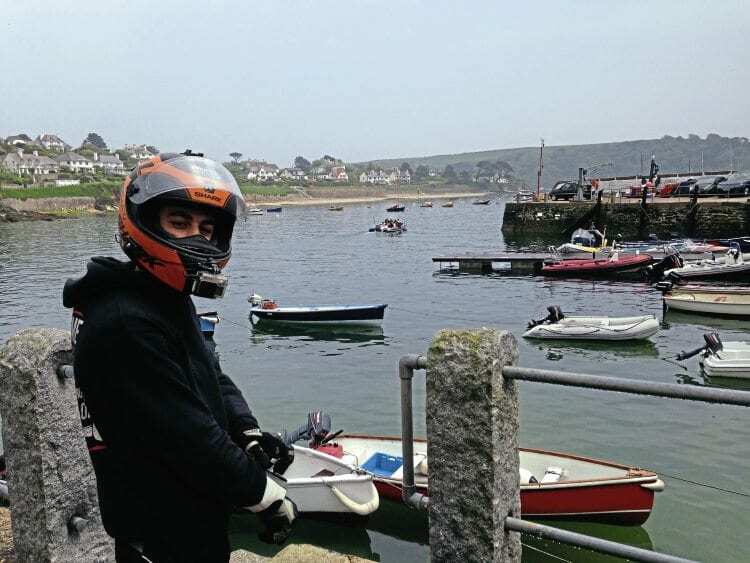 “I’ve just dragged your son and his bike off the road!” Luke was bruised, adrenaline holding him up, but thankfully not badly hurt – he still has no idea what happened. With his bike cobbled together, and Lindisfarne like a dream in the mist, we made it to Edinburgh. Despite Luke’s off, spirits are high in John o’Groats. 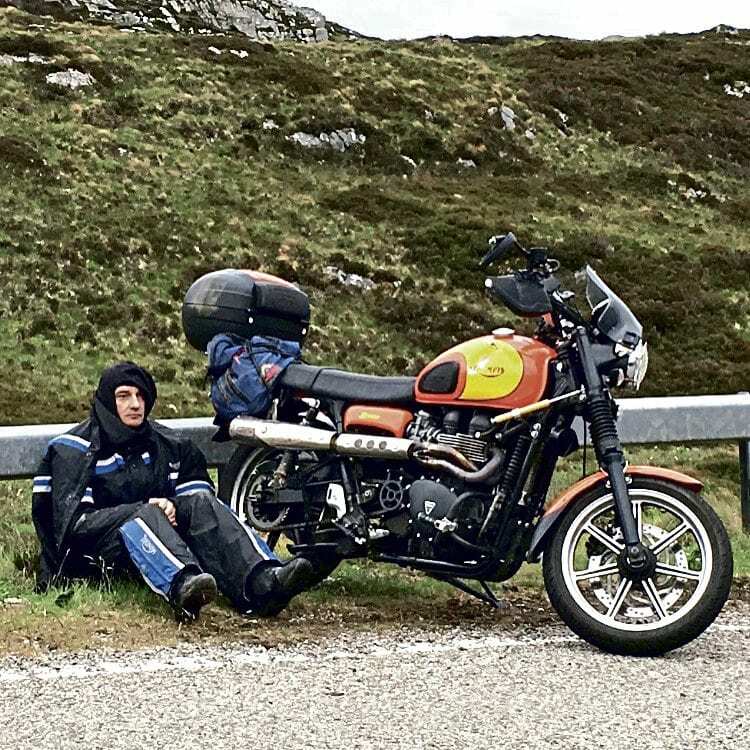 After a non-productive visit to Edinburgh Triumph (where the customers were more helpful and we were charged £2 for a jubilee clip) we felt too jaded for the scheduled 350-mile scenic route north and A9 ‘d it all the way to Inverness – in the rain. The following day a warming sun and clear blue skies stretching to the horizon reaffirmed our decision to make this trip, underlined by beautiful vistas along the A9/A99. As we neared our B&B at Wick the sky grew even bluer in its endless width, while the sun had taken the chilly edge of both road and grateful riders. 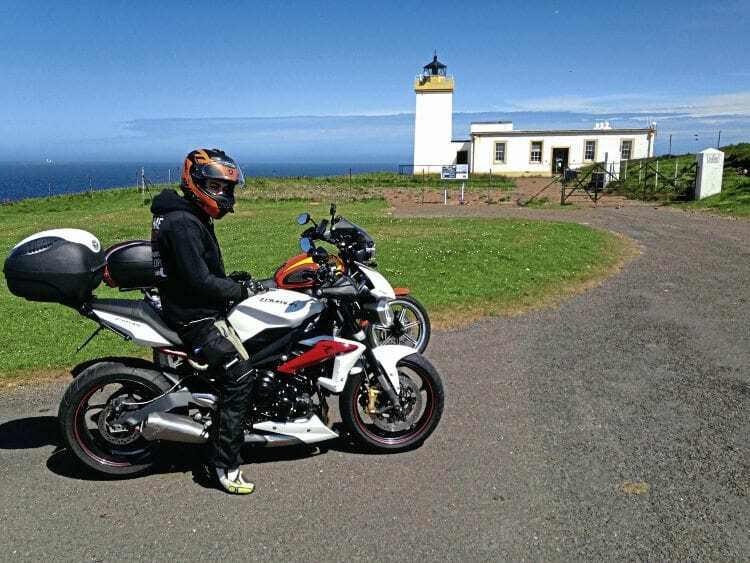 Confidence back, we took full advantage and rode on to John o’Groats taking in Duncansby Head – stunning. The aftermath. Nigel wasn’t badly hurt, but the holiday ended here. 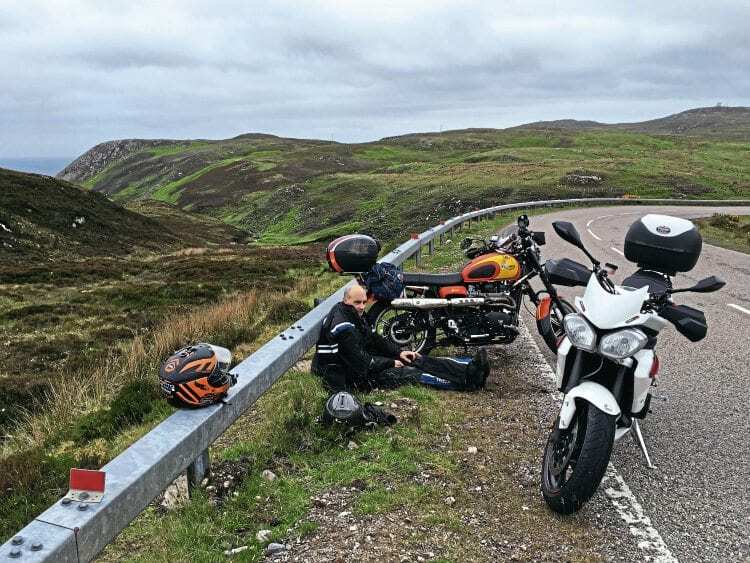 Next day an ominous damp gloom returned, but after visiting a blustery Dunnet Head we rode on to the A836, one of biking’s best-kept secrets. From Thurso, past Dounreay and on, the road surface wasn’t ideal, rough in places, my tentative cornering manifested again and concentration stole both enjoyment and the scenery. With a troublesome car pushing from behind (Luke was about to wave them by) the inevitable happened. Nigel can’t look at the Bonnie. Perhaps I was going 5mph faster than I normally would into a bend… An almost low-side bucked me all the way back to a crunching high-side. I like to think I made a conscious effort to low-side the bike as I saw that shiny new barrier swiftly approaching. It was almost down but then suddenly grabbed the verge and tossed me all the way back over. Luke said the bike almost flipped itself in an attempt to kick me while I was down. In truth, apart from thinking “I bet I look like a right plum” as I bee-lined for the barrier, I don’t remember much about it. Analysing Luke’s GoPro footage seems to show a combination of my bike tram-line twitching and me foolishly tapping the back brake in panic or instinct as the bike sat up. 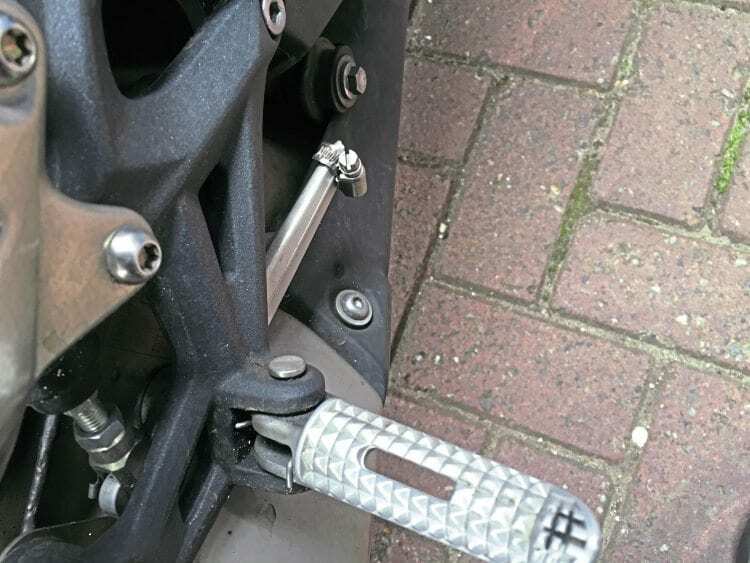 Luke and I both consider ourselves very lucky (a rider in a similar accident followed me to hospital in a critical condition – I hope he and his pillion are okay). As I careered across the road, Luke blindly following, we were thankful nothing was coming the other way – luck indeed. It could have been worse, and bikes are only steel and rubber, but I still cried when I saw it. The holiday ended as far from home as we could be. Police, ambulance, hospital, mild concussion, cracked ribs, wounded pride, several bruises. 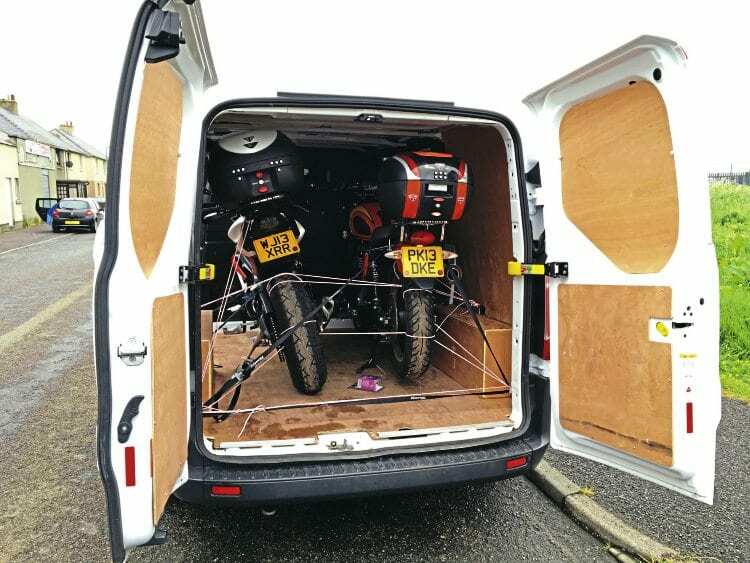 Both bikes were recovered via 1200 miles in a rented van, where we learnt to laugh again (painfully). 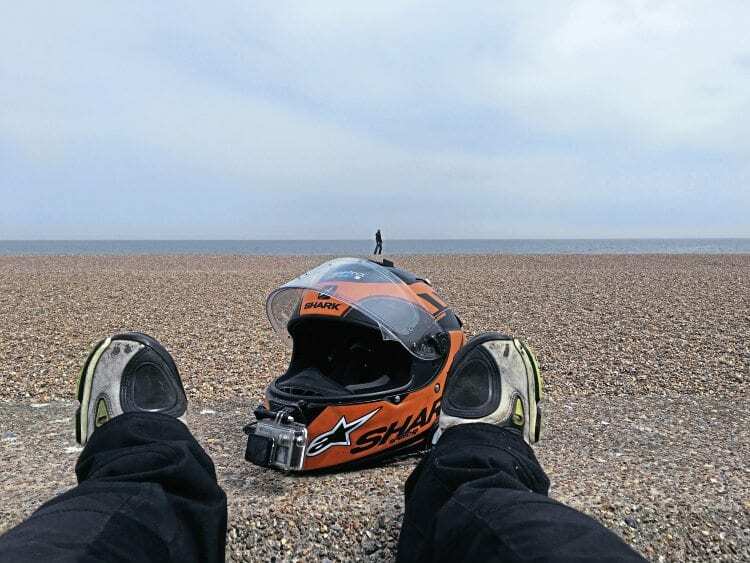 But I did have 1720 cherished riding miles with my son, and we’re already planning a clockwise return. 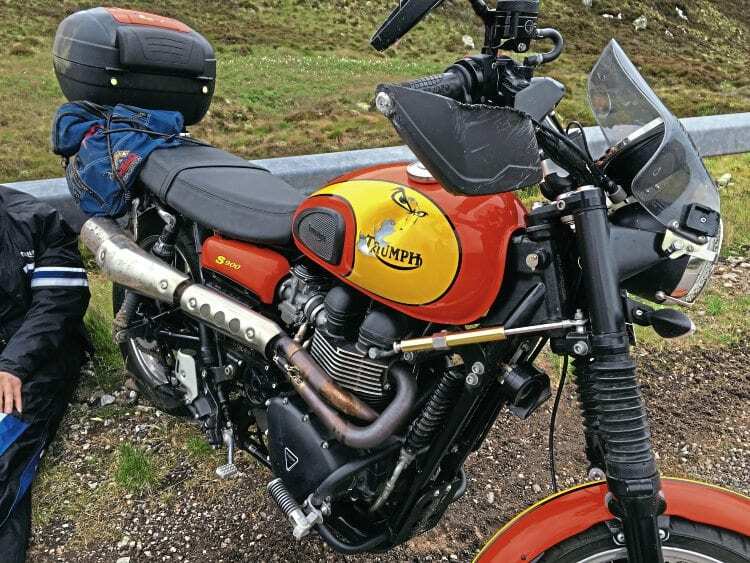 Nigel and Luke both recovered, and the Triumphs are repaired – they’ll probably have finished the ride by the time you read this. 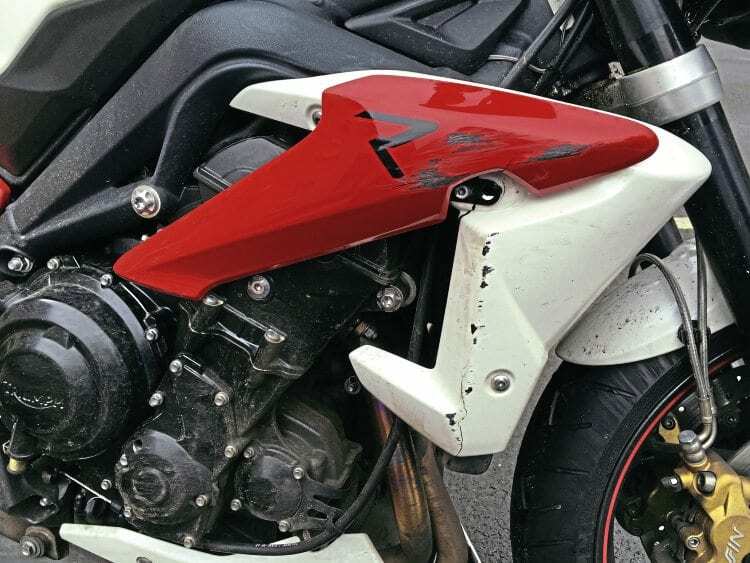 Previous Post:9 Christmas gift ideas for a motorcyclist! Next Post:MSL January 2019 out now!